Sometimes, publicly owned area becomes deserted because of its unconfined openness. Unfortunately, Frances Hashimoto Plaza was about to become such neglected place. Our club members conducted some hearing from the surrounding businesses to find out what's creating such neglect. Their responses were mostly very "negative." "Oh, flower pots are beautiful, but they will be stolen right away!" "The City does not provide maintenance and eventually this place will be forgotten!" "This is the sleeping place for some and scary to just walk through!" etc, etc. Remembering Frances' community spirit, Rotary Club of Little Tokyo decided to turn this place around and make it a joyous place for people to convene and bring the community bonding. As we initiate this improvement project, we wanted to make such changes look as spontaneous as possible so that such gradual changes will be rooted slowly and securely. We invited other community organizations for participation. Visited surrounding neighbors and businesses and invited them to our team. Then, how to sustain such public space became another challenge as California was going through severe water shortage. So, we requested some advise from Southern California Gardeners' Federation for technical guidance in selecting and planting of drought tolerant plants. Another help was offered by a nursery who reading about our attempt in local newspaper. 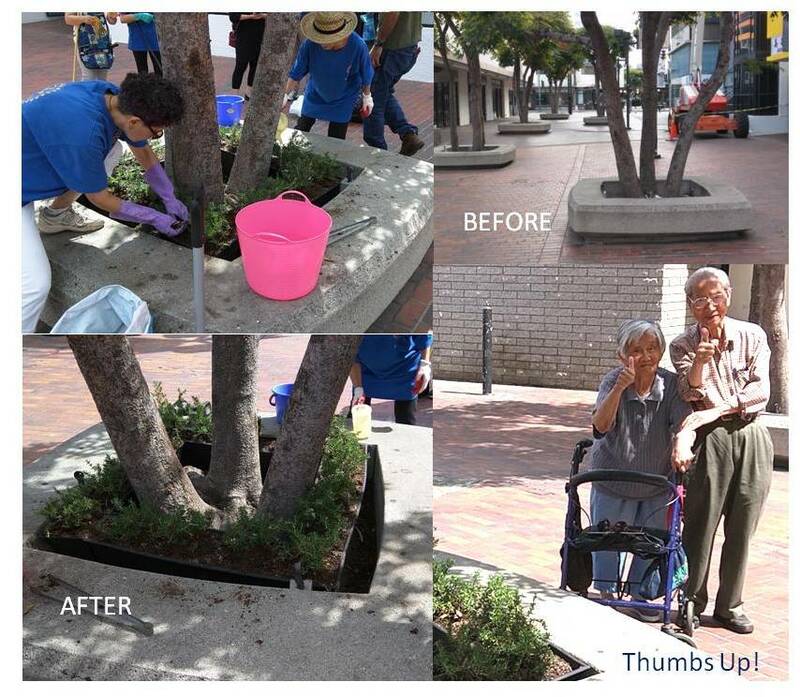 They offered us support in providing us some rosemary plants, a typical strong drought tolerant plant with comforting fragrance to add a flavor to the plaza ambiance. In fact, one of the restaurants decided to bring their table and chairs outside to share this special treat of rosemary fragrance. A ripple effect started as the restaurant owner's attempt to utilize the plaza more. The connecting alley is starting its beautification attempt, which trigger another visual effect event to stage in our area soon. So, our project will continue! How can we forget such "Rotary moment" as resident seniors during their daily walk across the plaza, took a brief stop and showed us their "thumbs-up" by saying "Thank you, Rotary Club!"